Pokemon GO came out recently, and for the first month or so it was extremely popular. Interest in GO has died down a fair bit at this point, but the release of Pokémon Sun and Pokémon Moon is already less than a month away. The longevity and consistency of Pokemon's popularity really is quite impressive. Since I stopped played after the first generation, I don't know a lot about more recent Pokemon, but it's crazy to think that there're going to be over 800 now. Catching them all seems like a pipe dream at this point! 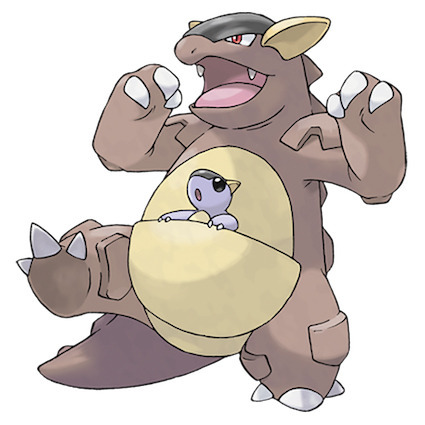 I touched ona few Pokemon tidbits before, but this time let's go all-in on some hand-picked Pocket Monsters from first gen which had some interesting names. The Japanese here is a cute pun: on the face of it it's just the phrase 「不思議だね」(fushigi da ne), "isn't that mysterious?". But ダネ (dane) (or rather the base form たね (tane)) can also mean 種 - "seed". I'm not sure which I like better - there's nothing particularly mysterious about Bulbasaur, so it seems more like they just worked backwards from the 種/だね joke. 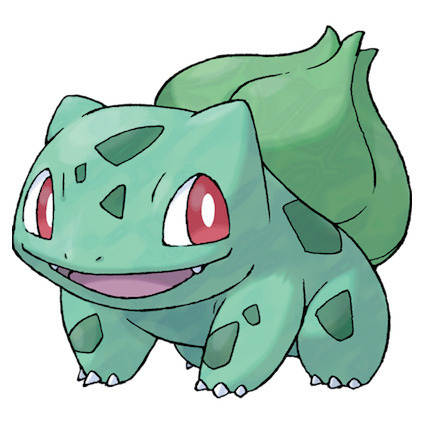 On the other hand, Bulbasaur definitely has a bulb, but he's never seemed particularly dinosaur-like or lizard-like at all to me. What do you think? It's the same basic joke setup in Japanese here as the last one: フシギソウ can be read as either 「不思議そう」("it seems strange"), or 「不思議草」 ("strange grass"). 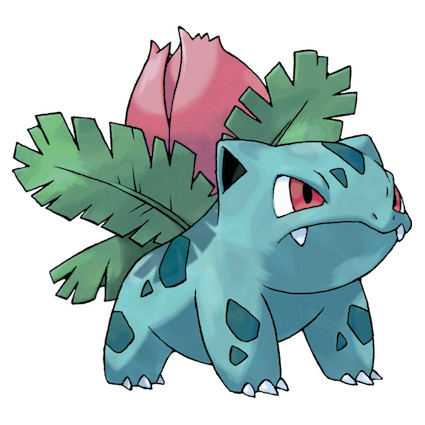 Not a whole lot to add here, but it is interesting that they went with "Ivy" instead of something about the blooming flower on its back, the main feature of the evolution. 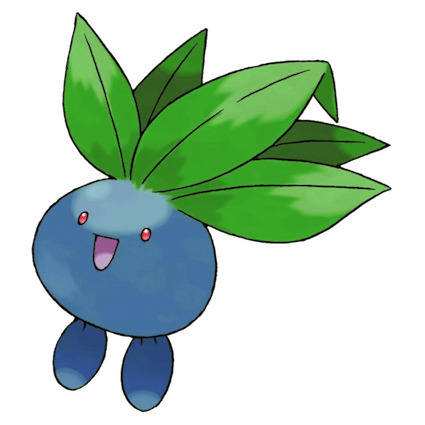 フシギバナ (fushigibana) follows on the same theme as the previous two Pokemon, but it's not really a pun this time - it just means "mysterious flower". 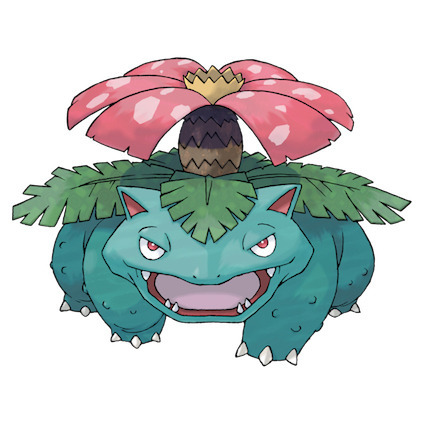 In writing this it also occurred to me that I didn't really know what the "Venus" in Venusaur is supposed to refer to. After looking it up, apparently it's a reference to venus fly traps. Go figure! 「火蜥蜴」 (hitokage) is just the Japanese name for a certain type of salamander, but it has the word/character for fire (火, "hi") right in the word, so the fire connection is already present. 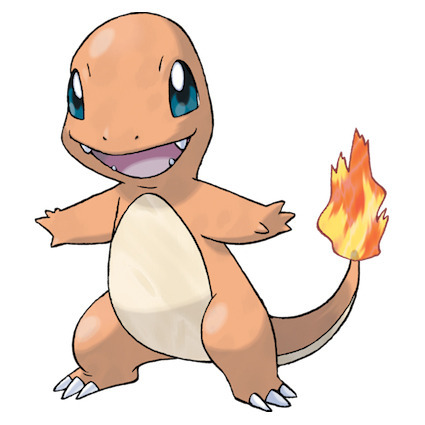 "Charmander" is pretty straightforward, and a great way of adapting the Japanese name into English. 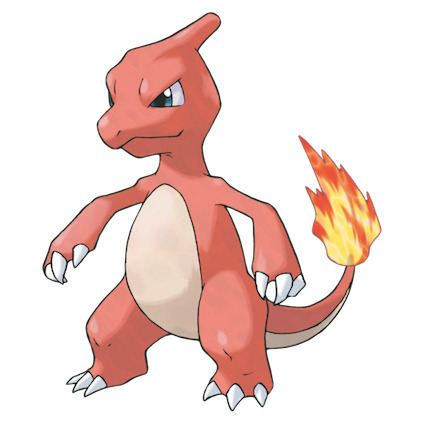 Charmeleon, on the other hand, has a pretty uncreative name in Japanese: it's literally just "Lizard". "Charmeleon" is admittedly a bit of a strange name itself, as it neither looks like a chameleon nor has any color-changing abilities, but a chameleon is a kind of lizard, so I guess we can let it slide. 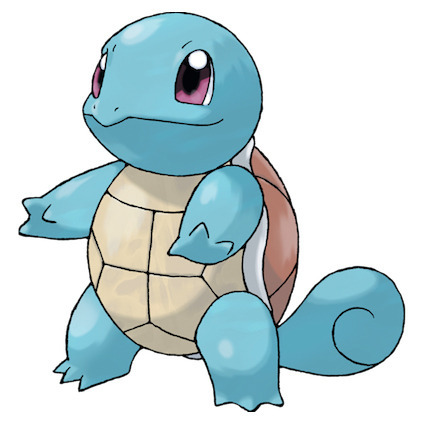 So we go from "Lizard", to 「リザードン」 - "Lizardon". There are a few theories of where the "on"/"don" comes from, from "dragon" to the suffix "don" used in many dinosaur names, and even some people who think it's a reference to the mafia term "don". Whatever the intention was, it's certainly a step up from "Lizard" in any case. 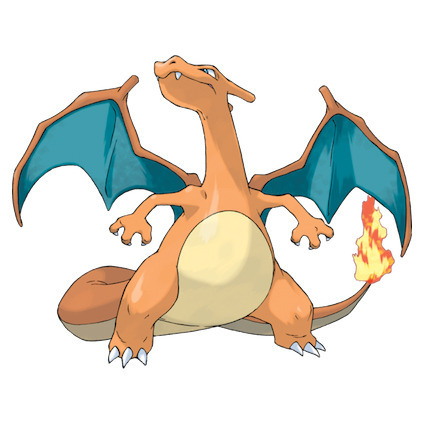 Incidentally, if you didn't know what Charizard looked like, I feel like the name itself doesn't give off that intimidating of an image - "char lizard" doesn't exactly bring to mind a huge, fire-breathing dragon-like creature if you haven't already seen it! This one's not a pun at all either; ゼニガメ/銭亀 (zenigame) just means "young turtle" essentially. The English name is particularly well done in that it's a double-pun - "squirt" as in "kid", to refer back to the Japanese name, and "squirt" as in squirting water, which is what it does. It's not quite clear what the Japanese name, カメール (kameeru), means. The "kame" bit just means "turtle", but the best explanation I've seen for the whole thing is that it's a play on 嚙める (kameru), which has to do with biting, and would make sense given the fangs it sports. 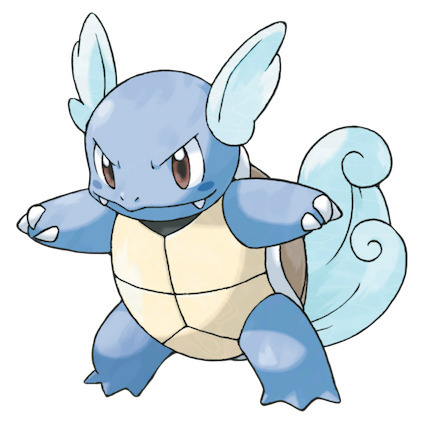 The English name is another great example of how a slight change can really make a big difference: "Warturtle" and "Wartortoise" both sound kind of lame, but when you combine the two, it ends up actually rolling off the tongue quite well! カメックス (kamekkusu) is another bit of a mystery, we have "kame" again, with what basically amounts to an "x" at the end. The most reasonable idea is that it's a combination of "kame" and "max". 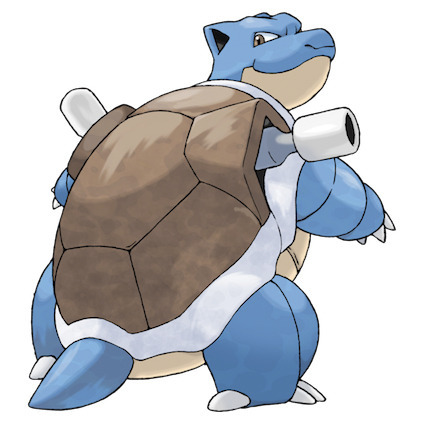 Another thing that caught my eye is that although "Blastoise" is a combination of "blast" and "tortoise", the "toise" bit is pronounced differently between the two words. It's small, strange differences like that which make English a very unique and sometimes confusing language! 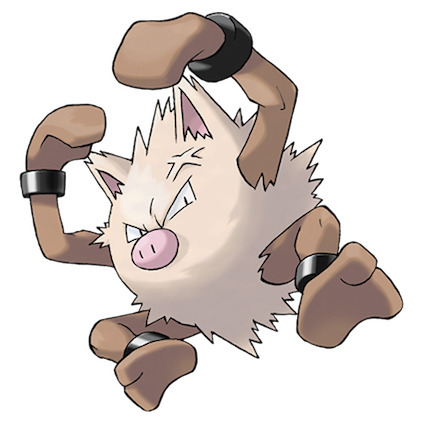 A lot of both English and Japanese Pokemon names are basically portmanteaus, but some of the Japanese names - this one included - feel a little less creative than they could be. Here we have オニスズメ (onisuzume), literally just the word 鬼 (oni, demon) followed by the word スズメ (suzume, sparrow). 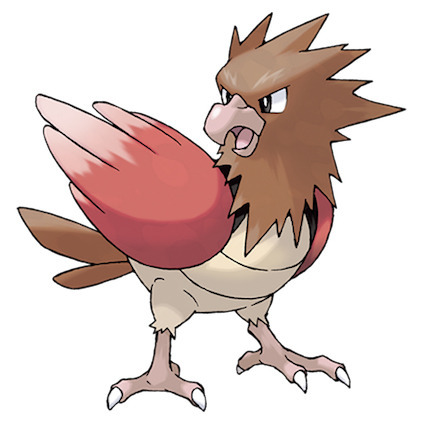 I think we can all agree that "Spearow" sounds a little bit cooler than "Demon Sparrow" would, yeah? This is an interesting case. 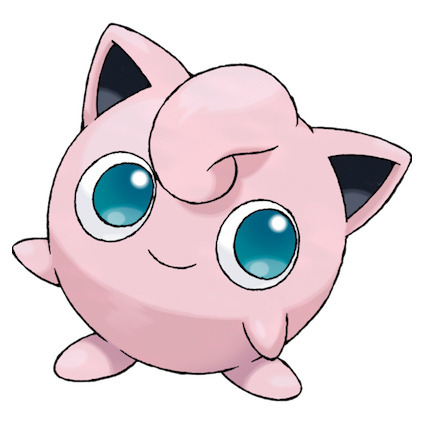 プリン (purin) is the Japanese word for pudding, and both that and "Jigglypuff" are trying to get the same basic message across - a jiggly little blob of a Pokemon. The issue comes from the fact that "pudding" in the US and "pudding" in Japan are two quite different things, so a simpler more direct translation like "Puddin" wouldn't really have worked. 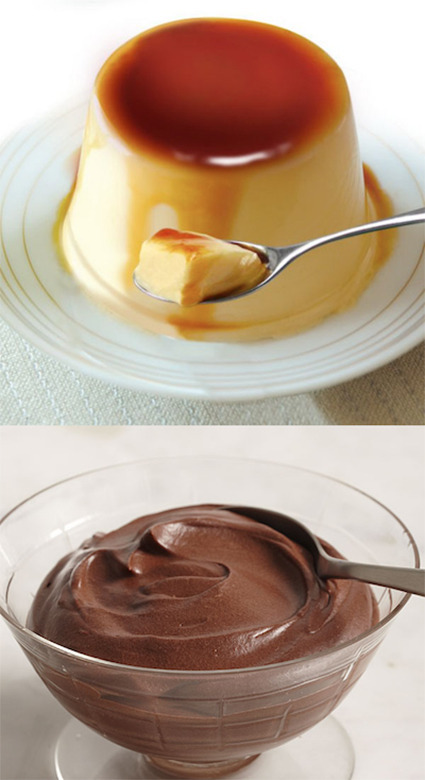 「プリン」と「pudding」は全然違う。 / 「プリン」 and "pudding" are not the same thing! Time for another straightforward Japanese name! Here we have ナゾノクサ/謎の草 (nazo no kusa), which literally means "strange grass". Honestly I wonder how much it changes the feel of the names just by writing them in katakana. Maybe that stylistic choice alone is enough to make it interesting for young Japanese players? Regardless, the English keeps the "strange" element of the Japanese one, and combines it with "radish" (which is much more what the Pokemon looks like than just "grass") to make a very effective name! オコリザル, or 怒り猿, just means "angry ape". The English name loses out on the "angry" nuance, but it's still impressive how by changing just one letter in "primate" can create another double-pun, specifically both "primate" + "ape" as well as "prime ape". This time around we actually have some pretty cool Japanese names for this family of Pokemon. ケーシィ (keeshii) refers to Edgar Cayce, ユンゲラー (yungeraa) to Yuri Geller, and フーディン (fuudin) to Harry Houdini, all famous magicians or mystics. 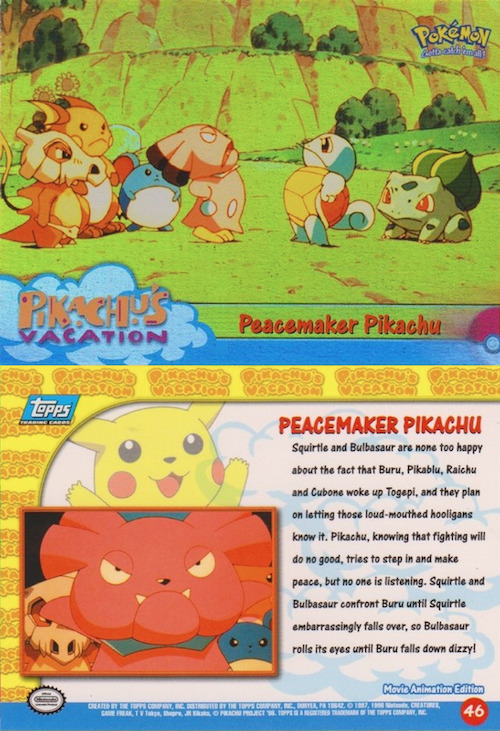 It turns out that Yuri Geller actually sued (and lost) for the unauthorized use of his name in the game, which may in part have contributed to the changing of these Pokemon in the English version to traditional "magic words". ゴースト is ghost. 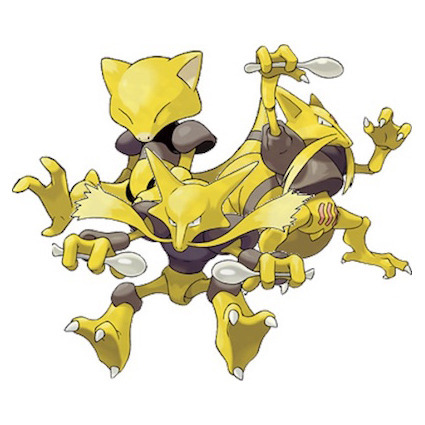 This Pokemon is literally just called "Ghost" in Japanese. 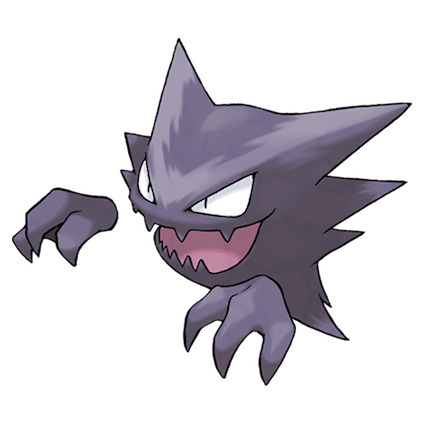 I mean, "Haunter" isn't necessarily the most creative thing ever but, it's not "Ghost". Oh boy, and this one? Y'know what クラブ means? Crab. It's just called "Crab". Aren't these supposed to be made-up animals? 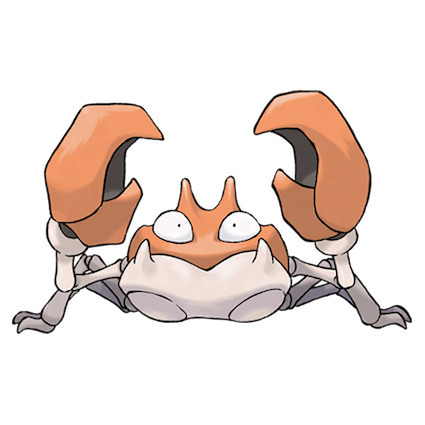 It's rather convenient that we have the word "crabby" in English to make a pun from, but they even went the extra mile and changed the "c" to a "k" for just that little bit of added zest! Alright, this, on the other hand, is a pretty decent name. ガルーラ (garuura) takes the back half of "kangaroo" and combines it with "ruler", which is not half bad. If you were feeling a little lazy, you could take that same idea straight into English and call it "Kangaruler" or even twist it a bit and go with "Kingaroo". But those sound kinda lame in English, don't they? Instead, they decided to go an entirely different route and make a pun on Genghis Khan. Recognizing situations like this, where a direct translation isn't actually the best idea, is an important skill in localization! ケンタウロス (kentaros) is a very slight variation on the Japanese word for "centaur". But...there's nothing centaur about this Pokemon, it's basically just a regular bull, so what gives? 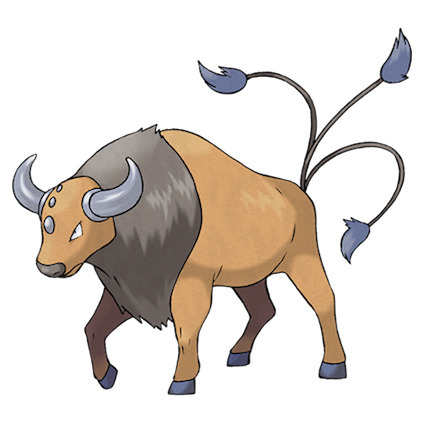 The back half of the name, Tauros, does, however, mean "bull" in ancient Greek, so it seems the localization team took the correct bit and left out the part that didn't make much sense. One last bit of trivia, mostly for the Japanese readers, but some of you younger folk might not know about this either. Way back in the early days of Pokemon, when the first move originally came to theaters, it was preceded by a short called "Pikachu's Vacation", which featured the first ever appearance of some of the new generation 2 Pokemon. At this point, the release of Pokemon Gold and Silver was still a long way off for the US, so not much information was available yet. So this brand new little blue mouse Pokemon started showing up in promotional images, and with no official name revealed and not many people knowledgable about the original Japanese names, a good portion of fans looked at the mouse shape and the tail, and decided to call it "Pikablu". なんと公式のトレカまで！ / This was so prevalent it even ended up on some official trading cards! PokéRAP (HQ) from Neil Cicierega on Vimeo. Check out the totally real legit Pokerap. I also have an announcement! 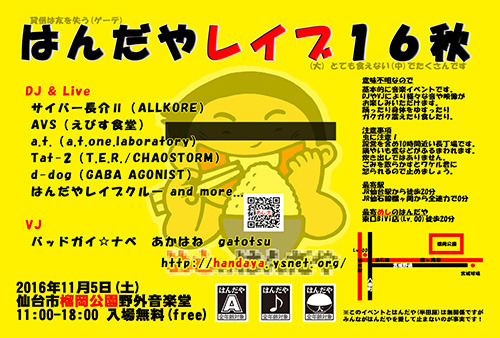 I'm going to be playing at Handaya Rave in Sendai next month as サイバー長介II! I've got a few new things planned, so if you'll be in the area, check it out! There's always lots of great food at Handaya Rave as well. Finally this month, I'd like to give a bit of a shout-out. I decided to check out Legends of Localization since I hadn't in a while, and it turns out he's done a little article about some of the strange translations in The Goonies II. Not only that, but he was kind enough to drop a link to my own entry about the game at the end of his article! I really appreciate the mention, since Legends of Localization is the main thing that inspired me to go down the route of talking about game localization on this blog. If you haven't checked out the site before, I very much recommend giving it a look, as there's a lot of very interesting features, all thoroughly researched and documented! Anyway, that's all for now, see you next month!